Jet off to the crystal waters and white sand beaches of Grand Cayman for the perfect Cayman Islands honeymoon. Couples looking for the classic beach honeymoon should consider Grand Cayman and a Cayman Islands honeymoon. Grand Cayman's expansive white sand beaches, crystal clear waters, and palm trees set the scene for a beach paradise. Prices are typically higher than the US, and accommodation will be particularly high during the winter, so honeymooners on a budget should plan carefully. Those looking to save on peak winter prices should look at the March-June shoulder season. The activities on the island are typical of a destination dominated by the beach. The waters are excellent for swimming, snorkeling, and diving. Those looking to try diving will find multiple providers offering first timer/beginner level dives and instruction. The Turtle Farm and the sandbar known as Stingray City allow visitors to interact with two iconic examples of local marine life. The more exploration-minded may enjoy chartering a boat for a period of time to explore to neighboring waters or go deep sea fishing. Grand Cayman has everything to give you the best relaxing Cayman Islands honeymoon you could ask for. Grand Cayman has a consistently hot climate in which the temperature fluctuates only a few degrees between 83 and 90 degrees during the year. However, the island does have a wet season during the summer, and the winter is relatively dry. Consequently, the high season occurs during November to March, as North Americans and Europeans will flock to escape the winter—and Cayman Islands honeymoons are particularly popular during this time. Stingray City: The island’s most famous attraction involves a visit to a sandbar where stingrays congregate and are fed by eager tourists. A must-do during any Cayman Islands honeymoon. Pirates Week Festival: Centered in George Town though with events all over the country, this mid-November festival celebrates the history of the islands –and yes, it features pirates aplenty! Cayman Islands National Museum: This museum houses a number of artifacts connected with the history of the Cayman Islands. USS Kittiwake: This former US submarine was sunk in 2011 to create an artificial reef now popular with scuba divers and snorkelers. Batabano: This carnival of Grand Cayman takes place at the end of April or early May and features steel drum bands, costumed revelers, and delicious exotic food. Horseback riding: The beaches of the island are perfect for a relaxing ride during your honeymoon. Diving: The crystal-clear Caribbean waters are perfect for diving. Numerous operators are found around the island. Boatswain’s Beach: Home to the world’s only commercial Green Sea Turtle farm, this facility is devoted to conservation and education related to the species. Pedro St. James National Historic Site: The oldest building in Grand Cayman offers insights into the history of the island since it was built in 1780. Boat Charter: Grand Cayman features numerous choices to hire a boat to explore, fish, or visit neighboring islands during your Cayman Islands honeymoon. Dolphin Discovery: Located near Boatswain’s Beach, you can swim with the dolphins here! 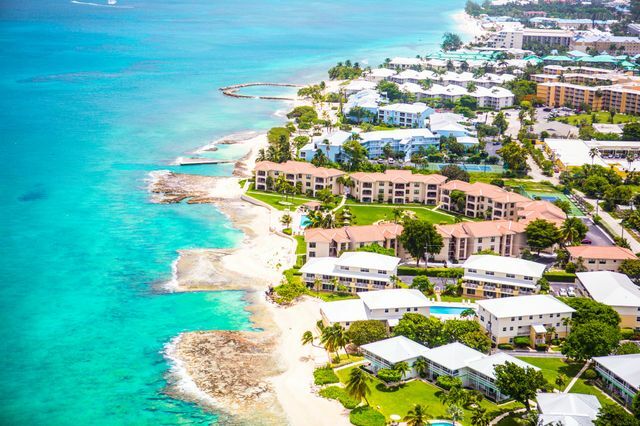 Seven Mile Beach: This beautiful beach is the highlight of Grand Cayman’s beaches, and your honeymoon would be incomplete without a visit to it. Cayman Spirits Co. Distillery: If you enjoy a rum-based drink in the spirit of the Caribbean, you might enjoy a tour and tasting at this Cayman distillery. Has anyone been there or planning to honeymoon there? Which areas have the best beaches? I'd like to hear some opinions about it!